An introductory text on commercial and leisure horticulture. Suitable for a range of further education students it covers the scientific principles underlying the successful growing of plants for the commercial cultivation of flowers, fruits and vegetables, for landscape planting and for gardens. Principles of Horticulture provides a comprehensive guide to the scientific rules determining the successful growing of plants. This valuable book covers the commercial cultivation of flowers, fruits and vegetables, landscape plantings and the individual garden. 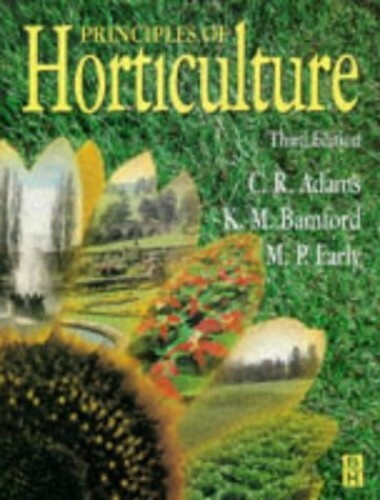 Unlike most horticultural texts, the level is suitable for a broad range of readers. The authors have a highly readable style and only a basic scientific education is assumed. The content has also been structured to meet the needs of a wide range of courses, specifically for the Royal Horticultural Society General Examination, the National Certificate in Horticulture, the BTEC National Diploma and the GNVQ Land & Environment. It also supports plant science and related modules for A-level Biology, and provides an introduction for HNC/D students. The new case studies will further enhance the usefulness of this book in independent study and as a college text.